This month, we are focusing on the Wisconsin Asthma Coalition (WAC) Walkthrough Program—an environmental assessment to identify and reduce asthma triggers in child care centers and schools. For Wisconsin HealthCorps members and students at the Alliance, this is the main program we oversee from outreach to implementation. To decide which child care centers and schools to contact about the program, we analyzed zip code data to find areas with the highest asthma burden. These targeted asthma reduction areas were identified by comparing emergency department utilization and hospitalization rates among people living with asthma across the state. Based on this information, the Walkthrough Program is focusing efforts on facilities in southeastern Wisconsin. Throughout the month of January, we called schools and child care centers to see if they were interested in scheduling a walkthrough. We provided additional details about the program and answered their questions. Three of the child care centers we reached out to decided to participate in the program and walkthroughs were scheduled for the month of February. At the beginning of each walkthrough, we give a brief educational overview of asthma, including physiological changes, symptom management techniques and common triggers. We spend about 30 minutes surveying each center to identify triggers in classrooms, bathrooms and play areas. Some common types of triggers we find are dust and dust mites, mold and mildew, and strong odors. Once each walkthrough is complete, we discuss the potential triggers with staff members and offer no-cost or low-cost solutions to reduce them. At the end, we evaluate what the staff members learned about asthma and ask if they plan to make any changes to reduce triggers. At three months and twelve months after each walkthrough, we send additional follow-up evaluations to assess the long-term impact and sustainability of the program. 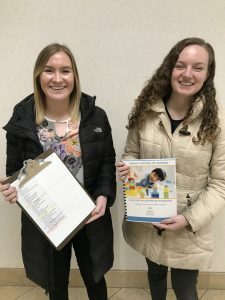 These evaluations also serve as an opportunity for the centers to request additional resources or asthma training from the Wisconsin Asthma Coalition and American Lung Association. Conducting the WAC Walkthrough Program is a unique and enjoyable part of the Wisconsin HealthCorps and student experience at Children’s Health Alliance of Wisconsin. It’s rewarding to see all the hard work we put into the program have a positive impact on children’s health. If you want to make your school or child care facility more asthma-friendly, please contact Brittany Farrell (414) 377-4570.